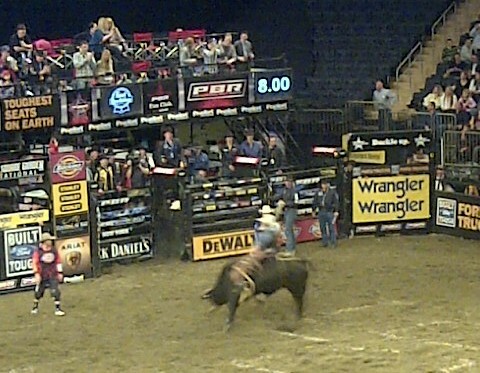 Professional Bull Riding – PBR – arrived at an unusual venue this weekend – Madison Square Garden in New York City. As an Englishman who’s idea of a good sporting event is a soccer match on a cold wet night in London, this was an unusual place to find me. But as I sat and experienced the world of PBR, I thought about how it compared to blogging – at least, when I wasn’t wincing at the beating some of these guys were taking..
1) 8 seconds. That’s how long the cowboy has to hang on to a 2000 lb bucking bull before he gets his score. It’s also about how long you have to persuade a reader to continue reading your blog. 2) Hanging on! I’m sure the 8 seconds seems like an eternity to the rider (and the bull?). Sometimes you want to abandon the blog because it’s too difficult to keep up with, or the comments are unkind. But it’s still easier than riding a bull. 3) Sometimes, it’s about the bull. It turns out that the score in PBR is based 50% on the rider’s performance…and 50% on the bull’s activity. So you might think you’re doing a great job, but if your readers aren’t into it – it’s time to focus on their feelings for a while. 4) Choose your audience, and cater to them. PBR is clearly a sport born elsewhere in the Americas and not native to the East Coast. The crowd at MSG last night was mixed – but primarily not a group that was well versed in the cultural basis of bull riding. So throughout the night, the commentary seemed to swing between helping us “newbies” understand the sport, and appealing to a TV crowd that would think of NYC as a tourist destination. The end result left both sets of spectators less than satisfied. For my money, better to treat it like any other event, and give us the full PBR experience, not a special NYC version. I had fun, and I would recommend PBR to anyone who wants to try something different. But next time, I’ll go to one in Texas. And yes, it was tempting to finish with a joke about BS – but I promised myself I’d resist!